Most media suites like to think of themselves as your one-stop shop, but it's rare to see quite so much packed into a single box. Cyberlink's offering comes in three different versions – Centra, Pro and Ultra (ranging from £50 to £120) – with the main difference not being which products you get, but which features are enabled. The excellent PowerDVD, for instance, is in all of them, along with its TrueTheater system for upscaling and polishing your movies, but you'll need the Ultra edition to watch Blu-ray. Similarly, while both Pro and Ultra are capable of authoring Blu-ray, the basic £50 Centra version is restricted to DVDs. The number of products available makes picking an edition somewhat confusing as it takes some research to find out exactly what is and isn't enabled for each app on each edition. The programs make a powerful toolkit. Taken individually, there are superior tools – for instance, we'd take Adobe Premiere Elements over a copy of PowerDirector any day – but together they cover an impressive range. In no particular order: PowerDVD is the best DVD player available for PC, especially with its aforementioned upscaling options. They're not going to make an old film look like a remastered Blu-ray disc, but they do mitigate the pain of having to drop back to low-res DVD every time you dig a classic film out of your disc pile. 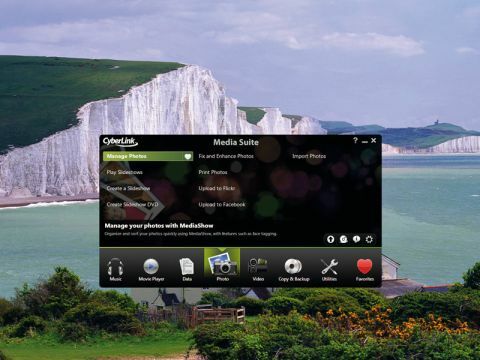 The same technology is offered in PowerDirector 8 as a way of fixing up your own video clips. This is especially handy if you're filming with something like a handheld Flip camera instead of a dedicated HD camcorder, although again, software can only do so much. Other features include a particle system for adding a bit more life to still images and goofy weather effects to snowy scenes, plus easy control over individual clips and direct publishing onto Facebook and YouTube. On a smaller scale, PowerProducer is another video based app, this time geared around video capture, burning to discs and making basic menus for DVD and Blu-ray, depending on the version you're using. On the organisation side, MediaShow handles image and video cataloguing, plus quick fixes and face tagging. Its photographic fixes are the standard ones, from red-eye removal to boosting saturation, but it also handles a number of video-based edits, including removing or reducing camera shake and dialling down the noise and murky colours. Both kinds of fixes are easy to apply to multiple items, making this a good timesaver for batch-editing files. Those are the headline acts. The rest of the disc is made up with less interesting fare, including a basic sound editor, CD burner, label printer and back-up tool, with the whole suite controlled from a basic launcher application, PowerStarter. This lets you pick the ones you want to use as favourites and ignore anything that you don't. Its menu is useful if you're learning the ropes, however, focusing primarily on tasks rather than applications so that you don't need to remember what everything in the suite does. The only thing missing from the set is a decent image editor, although since Cyberlink doesn't make one, its absence isn't much of a surprise. This is a comprehensive package, especially for the price. All the tools are the full apps that you'd buy individually rather than special editions or cut-down versions, and the low price means that you can easily ignore any that you won't use instead of trying to work out what fraction of the purchase price is going wasted. All of them make for a decent way to get started, without necessarily acting as a step-up on existing products if you've already bought a couple. As for complete newcomers, while none of the programs share an interface, the main tools are similar enough that jumping between them isn't tricky. Each features extensive help and access to Cyberlink's online community, complete with plenty of downloads and other assistance.